Salehinejad, J., Saghafi, S., Rahpeyma, A., Zare-Mahmoodabadi, R., Khageh Ahmadi, S. (2011). Intraosseous Ancient Schwannoma of the Mandible: A Case Report. Iranian Journal of Pathology, 6(2), 101-105. Jahanshah Salehinejad; Shadi Saghafi; Amin Rahpeyma; Reza Zare-Mahmoodabadi; Saeedeh Khageh Ahmadi. "Intraosseous Ancient Schwannoma of the Mandible: A Case Report". 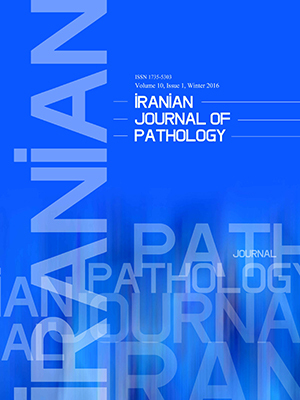 Iranian Journal of Pathology, 6, 2, 2011, 101-105. Salehinejad, J., Saghafi, S., Rahpeyma, A., Zare-Mahmoodabadi, R., Khageh Ahmadi, S. (2011). 'Intraosseous Ancient Schwannoma of the Mandible: A Case Report', Iranian Journal of Pathology, 6(2), pp. 101-105. Salehinejad, J., Saghafi, S., Rahpeyma, A., Zare-Mahmoodabadi, R., Khageh Ahmadi, S. Intraosseous Ancient Schwannoma of the Mandible: A Case Report. Iranian Journal of Pathology, 2011; 6(2): 101-105. Schwannoma(neurilemmoma) is a benign tumor originates from Schwann cells. Ancient (degenerated) schwannoma is a long-standing schwannoma with degenerative changes. Head and neck region is one of the most common sites for nerve sheath tumors but intraosseous schwannoma is rare. The mandible is the most common site of occurrence for this lesion. We report a rare case of intraosseous ancient schwannoma of the mandible in a 27- year-old woman patient. The tumor located in the ramus and angle region.